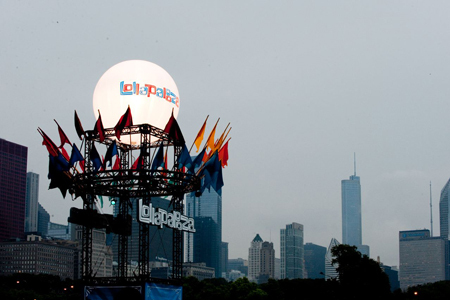 With Lollapalooza a little more than a week and since it will be my fourth year in attendance, I wanted to give you a list of 5 things you should experience at the Festival in Grant Park. I will be participating in all 5 of these “musts” again this year. 5. Eat a Lobster Corn Dog from Grahamwhich. Ever since the first year of attending this festival, getting a lobster corn dog has been almost as much of a tradition as going to Lollapalooza. It comes from Chow Town’s Grahamwhich booth and the price should not deter you from trying the tasty morsel. It is festival friendly, as it is a breaded lobster tail on a stick with a tasty dipping sauce on the side. If you have one you will find yourself craving another in the future. 4. See a Show at the Google Plus Stage*. The Google Plus Stage*, or “The Grove” as me and my friends call it, is a side stage where I highly recommend seeing a show. The stage was put in its current location when the grounds expanded 2 years ago. That was the year we saw Edward Sharpe and the Magnetic Zeros perform. During their set they made us all sit Indian-style for a song near the finish. It was a pleasant surprise that the crowd easily agreed and it is one moment from Lollapalooza that I will never forget. *Google Plus Stage has changed to the Google Play Stage this year. 3. Get there Early and Try to Walk into 1 Show Blind. The reason I say this is because the earlier you arrive the easier it is to beat the crowd. Also, seeing a band you have never heard of will either allow you to discover some new music or, you will realize a band is not for you, and then it is on to the next. I always enjoy arriving to Lollapalooza early so I can be pleasantly surprised by an early act, in addition to being able to walk right up to the stages and just having the ability to relax in space. The first year I attended on Friday we walked in and walked up to the main stage. That’s where I discovered Hey Champ. If I hadn’t gotten there early I would never have heard of Hey Champ so get out, live a little and be surprised. 2. Check Out the Farmer’s Market. The Farmer’s Market was introduced in the past few years but I didn’t actually check it out until last year. It quickly became my favorite area of the festival to get good healthy food. It is a great alternative away from all the other booths that make up Chow Town. When you are attending a festival, such as Lollapalooza, it is important to keep your body in good shape. It takes a little longer to get your food from this area but it is well worth the wait. Last year, it happened to be right next to the Google Plus Stage so you can kill two “musts” with one stone. Grab some great healthy food and enjoy a show at the Google Plus Stage. 1. Get Lost at Perry’s. Perry’s Tent is the heartbeat of Lollapalooza that can be heard from all around the grounds. It is something that when the music stops at another stage you hear the bass inviting you in for a little dance party fun. You should not try to fight the temptation to go in and let yourself go crazy. Just realize that once you enter you may not want to leave and there are other acts to see at Lollapalooza. This entry was posted on Tuesday, July 24, 2012 at 8:53 am and is filed under Music News, News with tags 1st Timer, Edward Sharpe and the Magnetic Zeros, Farmer's Market, Google Plus Stage, Grahamwhich, Hey Champ, Lobster Corn Dog, lollapalooza, Perry's Tent, Things to do. You can follow any responses to this entry through the RSS 2.0 feed. You can leave a response, or trackback from your own site. Yo, it’s the Google PLAY stage this year. Don’t get it twisted. But yeah, agree 100% with all of these. Yeah, I guess I am still living in the past and it would make sense that it changed to the Google PLAY stage since they are pushing Google PLAY with that free music they wanted to give out.